In my last article, I talked about generic Dive Safety and planning. This time we’re going to take a closer look at the PADI Rescue Diver Course and how that training will benefit you. Rescue Diver practice: responding to a scuba emergency on the surface. 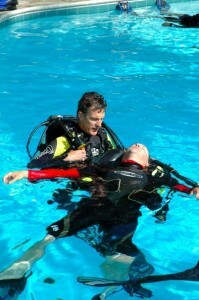 I like to think of the PADI Rescue Diver course as providing a tool kit for rescue divers. There is a lot of knowledge and a plethora of skills that we develop, but not all of it applies in every situation. You might have a toolbox with a set of sockets. When you need to tighten a bolt, you don’t use the 6mm, 8mm, 12mm and 14mm for every nut. You use the right tool for the job. Rescue Diver develops that critical thinking in addition to the skills. Let’s take a look at the knowledge and skills that we work on and then look at a scenario. Knowledge development can take place in a variety of ways. It can be entirely instructor led, or you can do some independent learning with a book and dvd or completely independently with the PADI eLearning Rescue program. You’ll learn about the psychology of rescue, equipment you might need for rescue situations such as oxygen, first aid supplies, etc. and accident management. The good news is that you’ll rarely use any of these skills. Probably, most of what you do is see something amiss on the dive boat. You’ll ask a short question or give a bit of advice and avoid problems altogether. 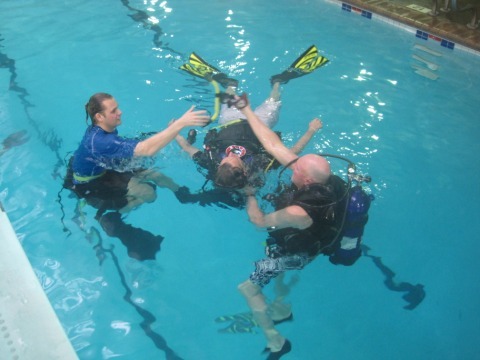 The plan with the Rescue Diver training is that you’ll be prepared to handle many situations. If you’ve not already completed it, you’ll also complete CPR (cardiopulmonary resuscitation) and first aid training, probably through the Emergency First Response (EFR) program. These skills are useful anywhere you go. Much like what you learn in the Rescue Course, though, it’ll be the simple first-aid skills you use most often (e.g., simple bandaging and patient assessment), not the life-saving ones. The down-side of learning these skills and not using them, is that you might forget how to do things. If it’s been more than a year since you took the Rescue course, get with your instructor and arrange a review session. At a minimum, you should refresh your CPR & First Aid skills every 24 months. The Rescue course culminates in two exercises that flow together: Unresponsive diver underwater and unresponsive diver at the surface. Here, you put all of your knowledge and skills together. Will you be stressed? Probably. That’s not a bad thing. If your instructor has planned well, the scenarios will be realistic and you’ll get to put everything together. Upon completion, you’ll probably feel somewhat exhausted but also exhilarated at having achieved this goal. I’ve been through advanced medical training and I always feel better after a major scenario practice. I know that I can handle a situation, and after completing the PADI Rescue Diver course you’ll know you’re ready to handle many situations that might arise while diving.